Spring is here! Hooray! 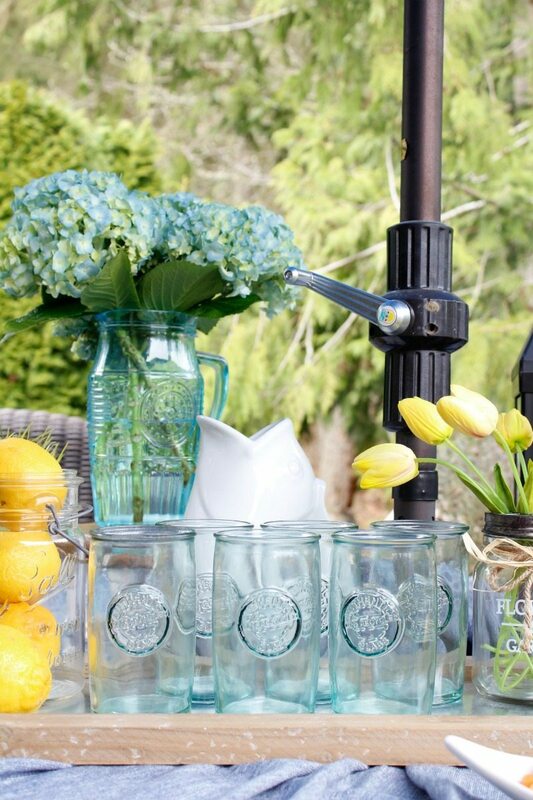 The arrival of warmer weather has us planning our outdoor entertaining. After many months of being stuck inside we cannot wait to start grilling and enjoying summer days and nights with friends and family. 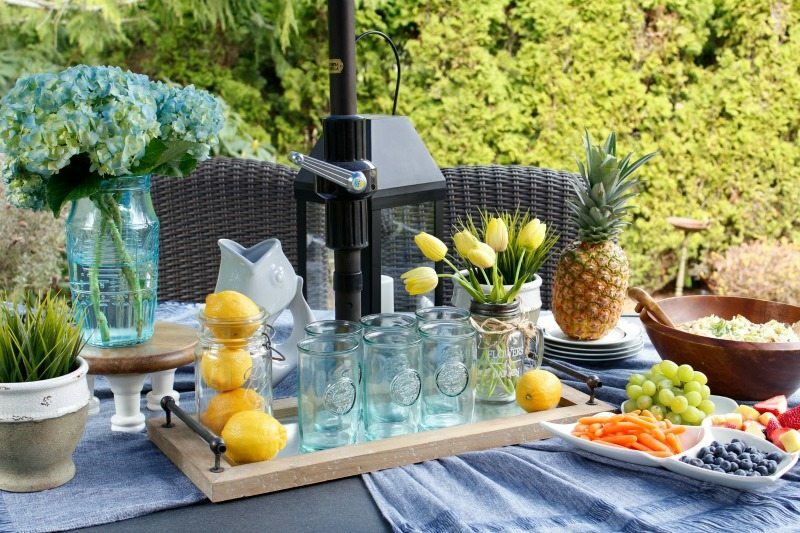 There’s an ease to outdoor entertaining that makes it so much fun. Jodie and I are casual entertainers, and we both firmly believe that if the host feels relaxed so will your guests. 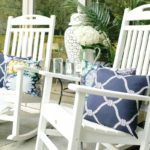 We’ve put together 12 easy and inexpensive tips for outdoor entertaining that we know will help you relax and enjoy! 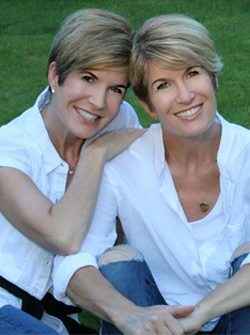 Jodie and I are SUPER excited and honored be part of the BHG Live Better Influencer Network for 2018. 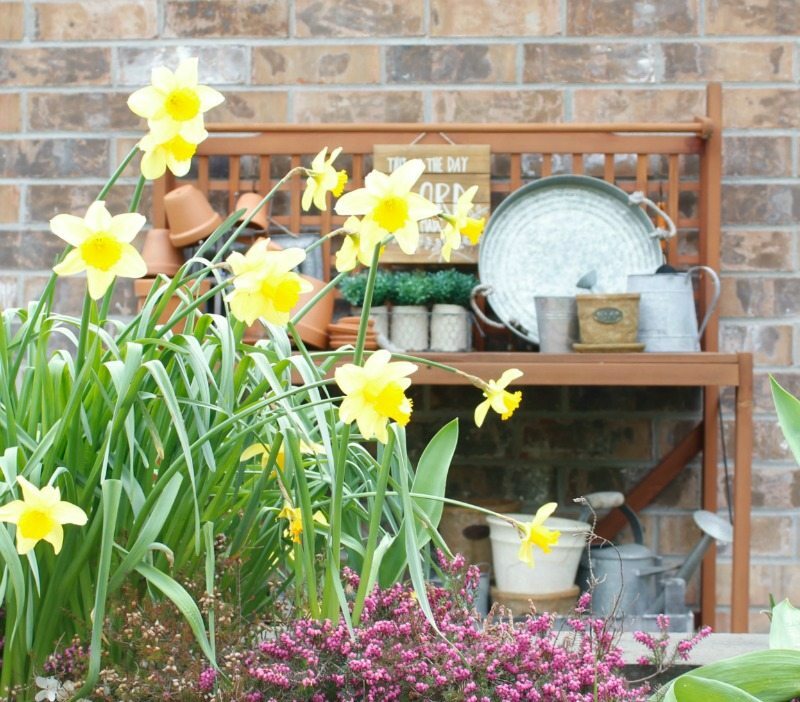 We are compensated when sharing our favorite finds from Better Homes & Gardens at Walmart. As always our opinions are our own. Affiliate links for product sources are included for your shopping convenience. 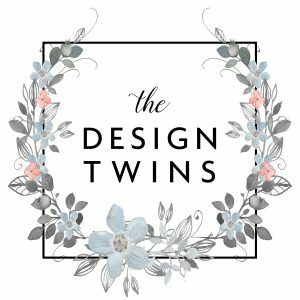 To enjoy more of the amazing BHG Live Better Influencer Network ideas for outdoor entertaining click HERE. This is Julie’s backyard in the suburbs of Seattle. Set amidst the evergreens it’s a great spot for outdoor get-togethers. Jodie lives in the East Bay of San Francisco. 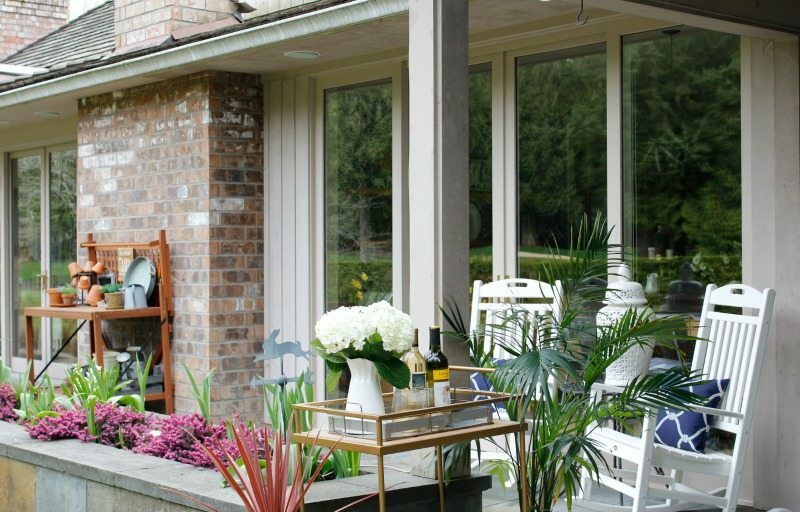 To visit her recent backyard makeover head to our blog post How to Create a Budget-Friendly Outdoor Oasis. Easy and fresh is always best. Fresh seasonal fruits and veggies are simple, colorful and provide healthy choices for everyone. 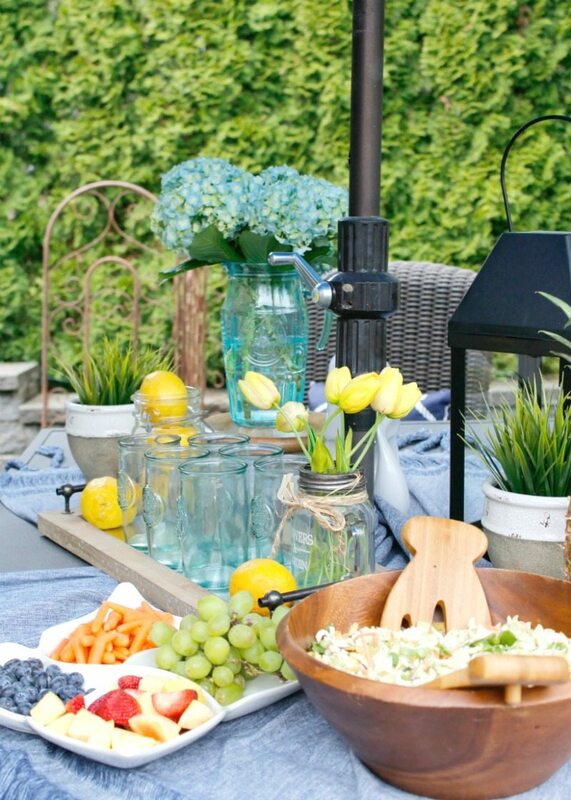 Salads, snacks and plenty of cold drinks and you’ve got a party! 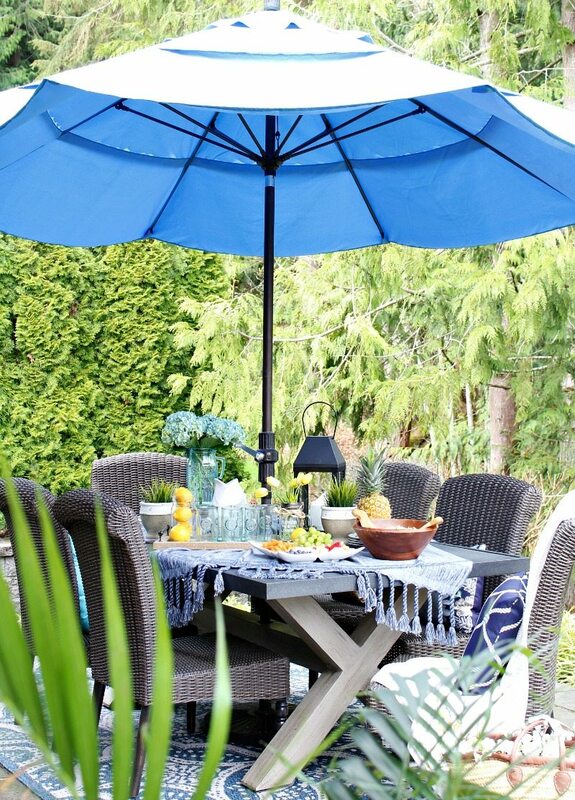 Not only does an umbrella protect your food and guests from the sun and unwelcome weather it also defines your outdoor dining space. 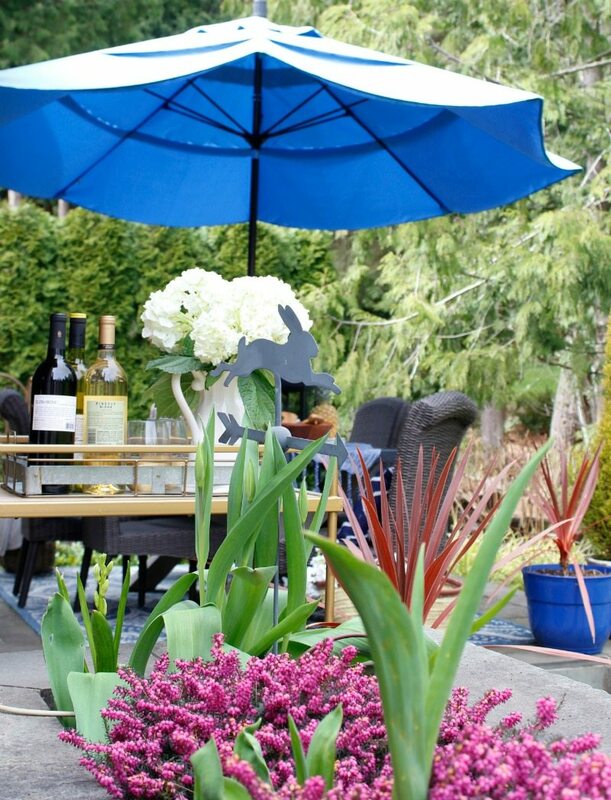 You can add color and character with the right umbrella. I just bought this amazing indoor-outdoor rug from Better Homes & Gardens sold exclusively at Walmart. It is no exaggeration to say that adding this rug transformed my patio. I couldn’t be happier with the quality or the price. Once again the value of Better Homes & Gardens products makes me simply giddy! Why giddy? I can afford to buy more without any sacrifice. Hip Hip Hooray! Rugs are so important. I might even say rugs are more important outside than inside! Don’t be afraid to put a rug just about anywhere, even on grass. A rug provides an instant room-like setting. 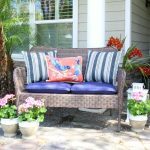 If your outdoor furniture is looking faded or weather-worn don’t worry. Before you go out and buy new furniture try changing out the pillows and/or replacing the cushions. This is a great way to make your old furniture look new and can save you a lot! Every few years I buy new outdoor pillows and voila, it’s like a whole new look to my backyard. 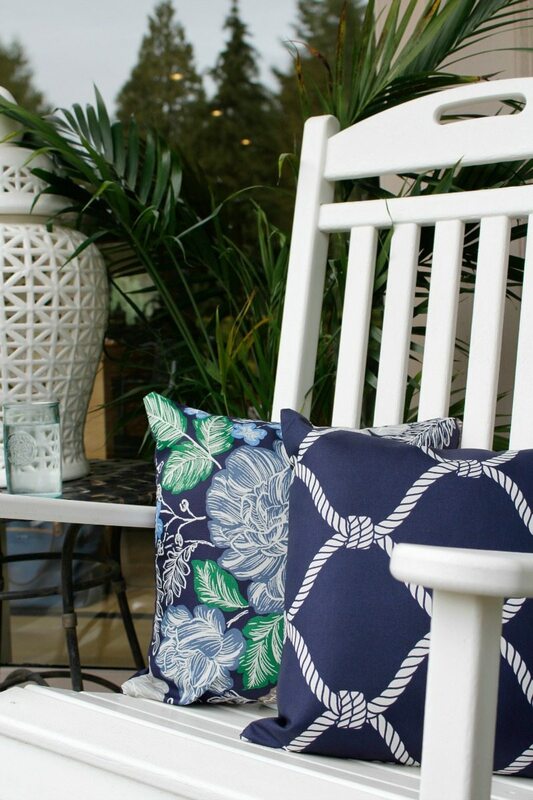 My new pillows from Better Homes & Gardens at Walmart created the perfect refresh for my whole patio this season. Tons of stylish choices. I had fun mixing and matching patterns. And at such great prices I was able to replace all my pillows under budget! Woo Hoo! Think outside the box for table coverings. I like to use colorful indoor throws and Turkish fouta towels to create a casual but festive table design. 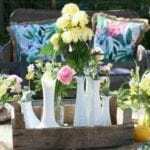 They are great to use on tables and also on the ground for a fun picnic feel that works well for almost all outdoor entertaining. Besides choosing less traditional throws and towels I also like to place them on angles to add a bit of dimension. Get creative. Almost anything that works inside can be re-purposed outside for an event. 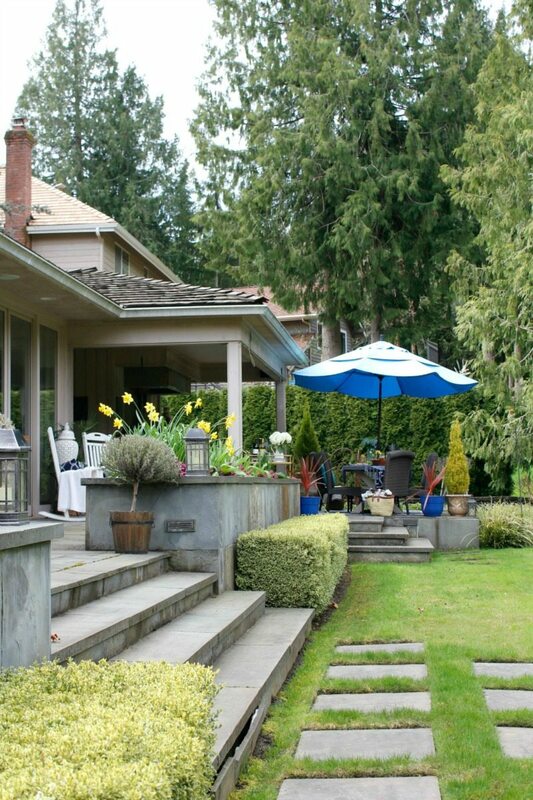 Create outdoor rooms where people can gather, get cozy and relax. Create conversation areas, lounging areas, and provide plenty of seating. Grab chairs from inside. Lay blankets and use pillows and poofs to make comfy areas for relaxing. 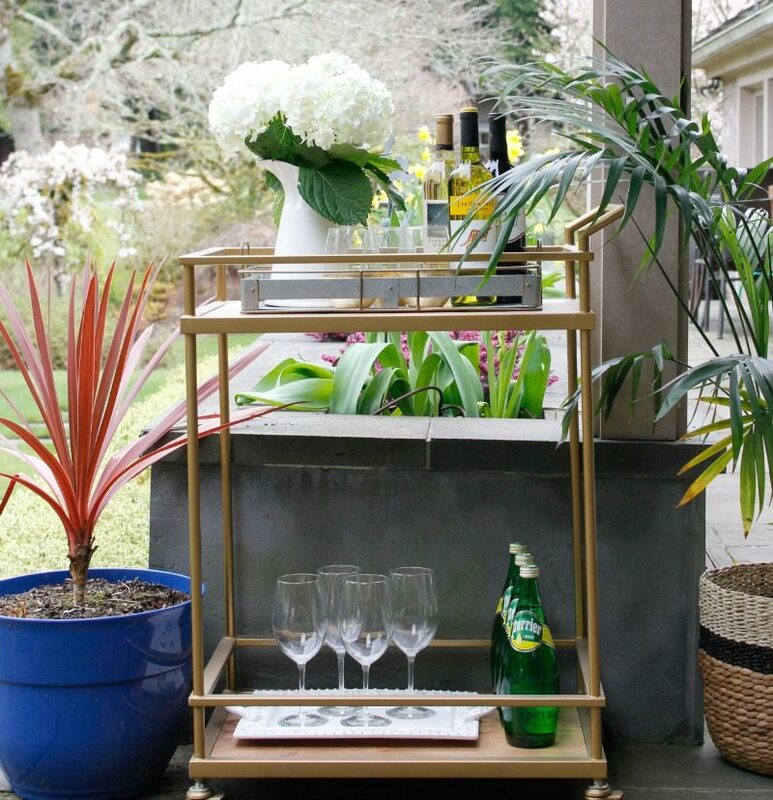 Or my example below, how about bringing your bar cart outside? 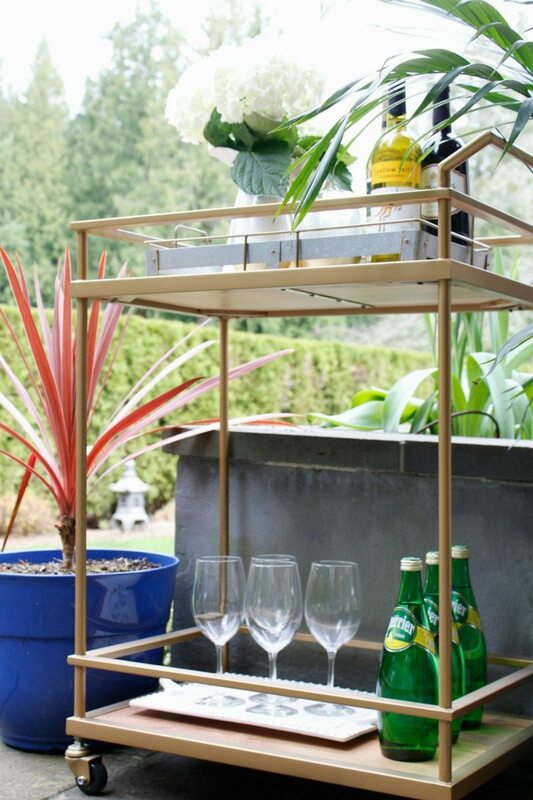 Create a serve yourself drink station using a cute and functional bar cart. 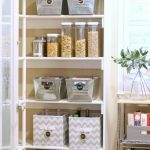 Provide extra essentials so guests can help themselves. Less back and forth to the kitchen means more time to enjoy your guests. Music is the backbone to a great party. You’ll want yours to create just the right mood. Get your music ready in advance. Create a playlist with music that you know your guests will enjoy. Be sure to not play it too loudly. Then it will be the perfect backdrop to conversation and fun. If you’re planning to cook on the grill do your prep work in advance. Especially if you haven’t used it all winter. Make sure it’s clean and ready to go. Do a dry run in advance. Nothing stalls a party like an empty propane tank! Don’t be afraid to ask a friend or too for help setting up. Chances are they will feel special that you felt close enough to ask them! Make the “set up” party just as fun: start the music, get your drinks, and do some taste testing of the food. With the right atmosphere your early helpers will feel spoiled and will offer to come early to all your events! Now if you’re a foodie, and you live to showcase your culinary talents, then You Go Girl! Let creativity be your guide. 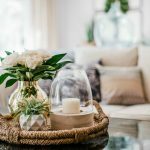 Better Homes & Gardens Brand sold exclusively at Walmart has so many stylish and well-priced options you can add just the right details to make your space complete. When the hostess has fun everyone has more fun! If your guests see you working hard they feel like they need to work too. 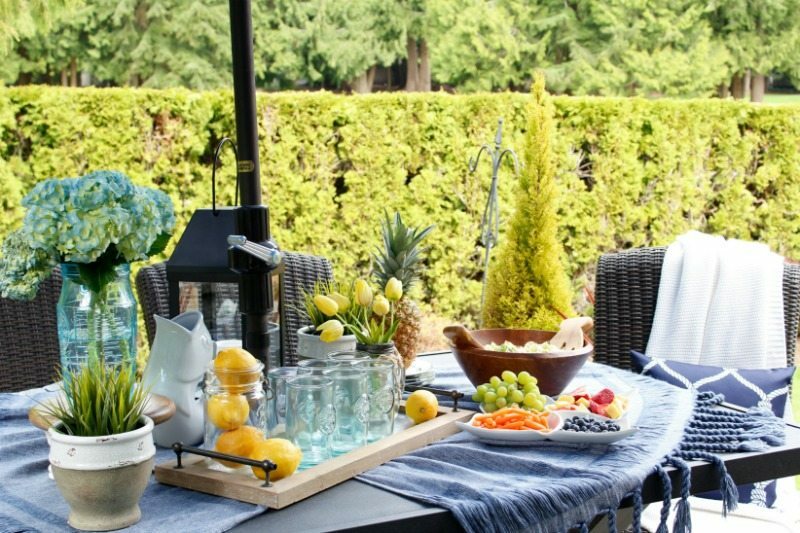 We think that if you follow these tips you will be able to create seemingly effortless outdoor entertaining. And the easier it is the more fun you’ll have. Do a little prep work, keep it simple, ask for help, and ENJOY! 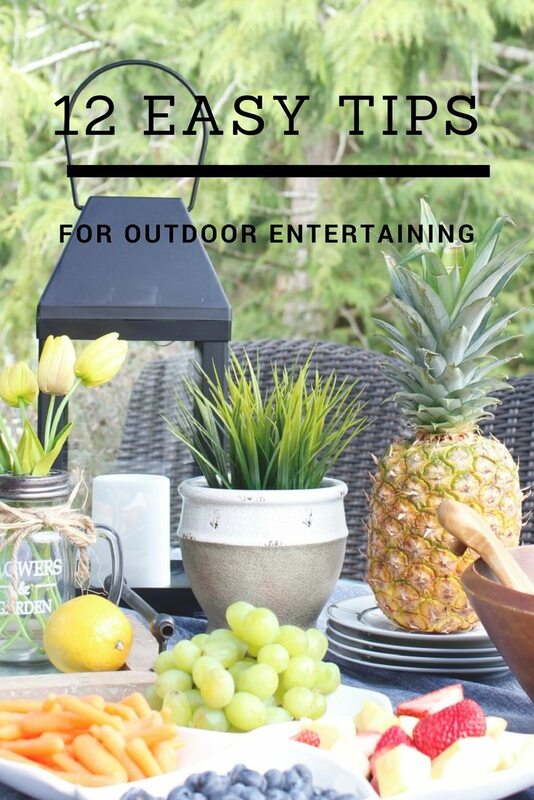 For more outdoor entertaining ideas be sure to visit these follower favorites, as well as the Better Homes and Gardens website! 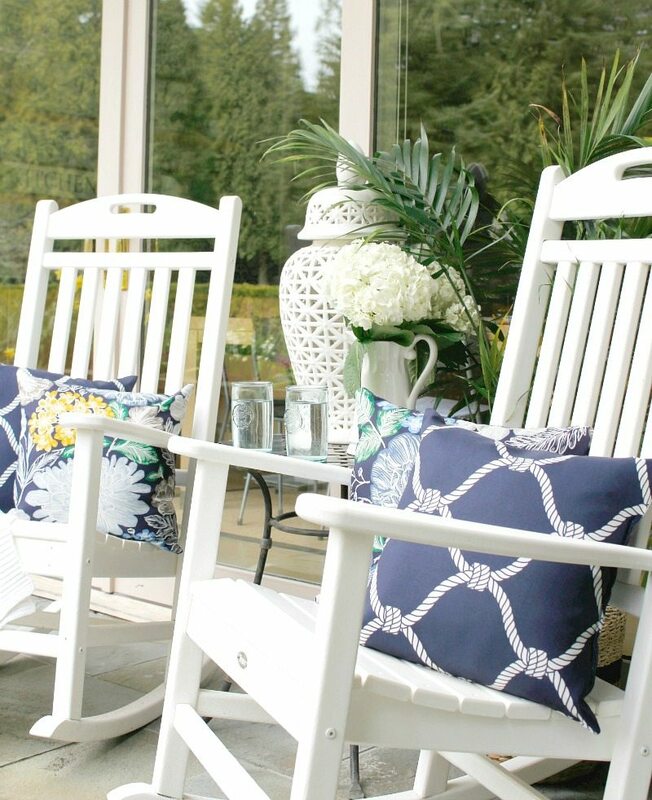 How to Make Your Summertime Decor Sizzle! 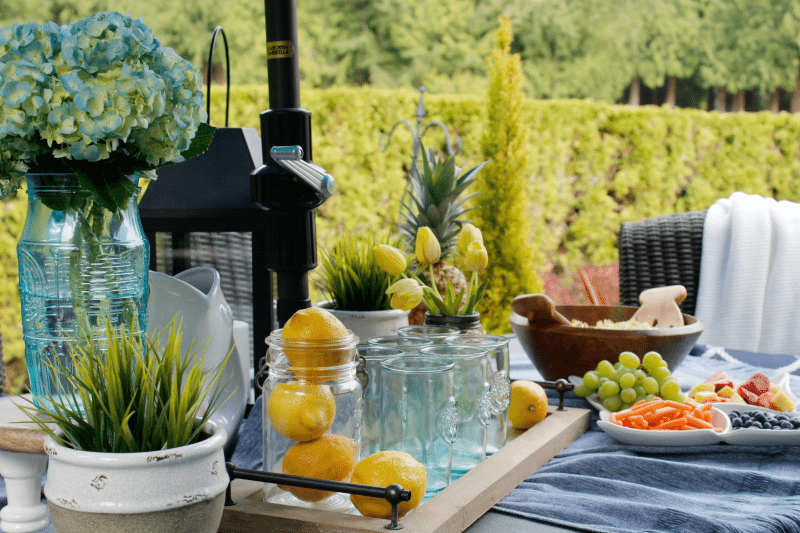 Outdoor entertaining made easy with these 12 helpful tips. With a little creativity, some prep work and these simple ideas you'll enjoy your parties as much as your guests! Love all your tips! 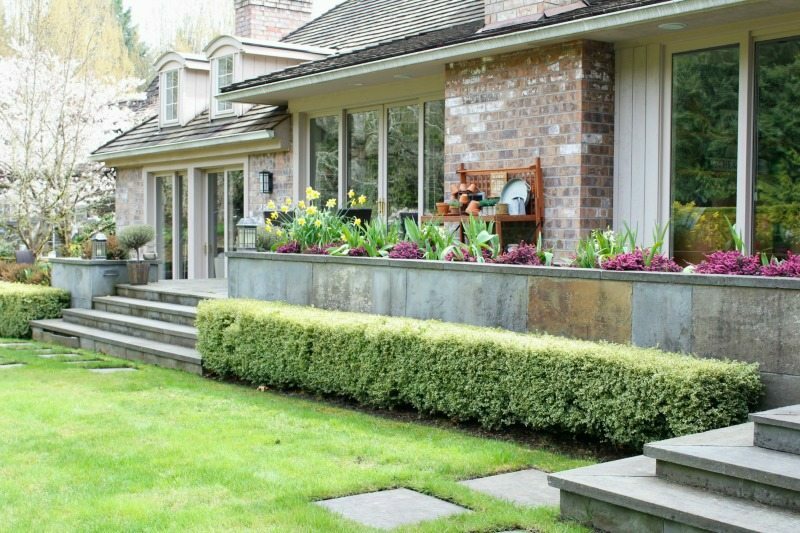 Your outdoor space is beautiful! Thank you for the sweet comments! You are just too sweet dear friend! Hope you have a wonderful week as well! Such great tips! 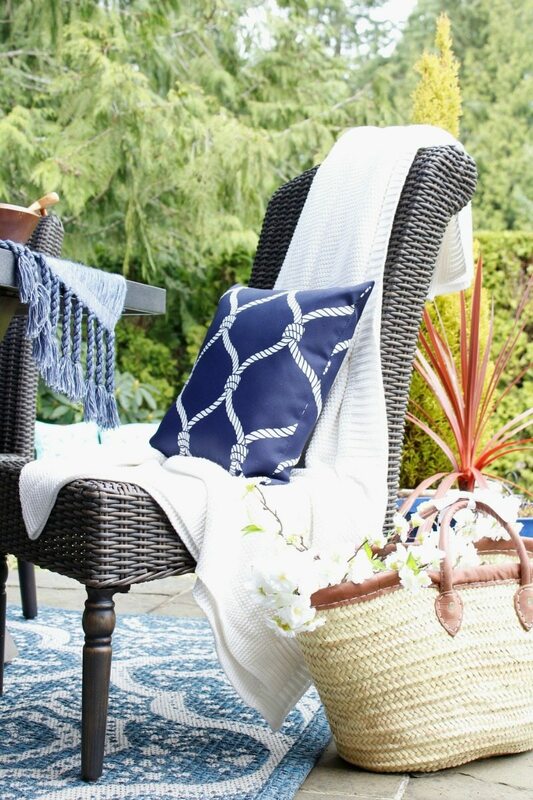 I like the throw idea to add a softness to our outdoor table! I will be throwing my daughter’s high school graduation party June 2nd so I’ll be sure to use these styling tips. Also, it’s so nice to be reminded that we don’t have to have a gourmet meal when entertaining friends, but to keep it simple. I think that’s what keeps many people from having friends over. I purchased the black & white striped umbrella from Walmart and I love it! Lovely! Could you please provide the source of the beverage glasses and matching pitcher? Where did the cute green glass glasses and pitcher come from? So perfect! Beautiful setting! 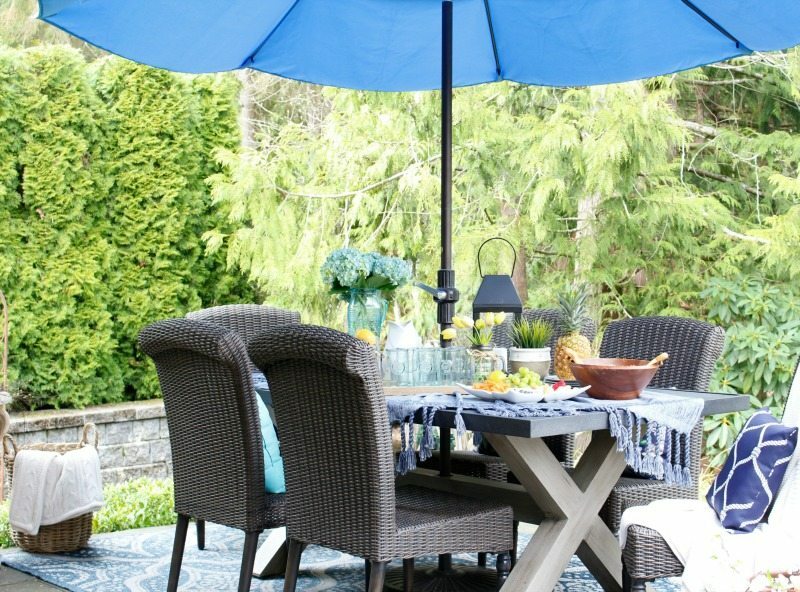 Would you plese let me know of where you purchased the outdoor dining table? It is wonderful and the perfect scale for my backyard! Great post. So many things I hadn’t thought of. 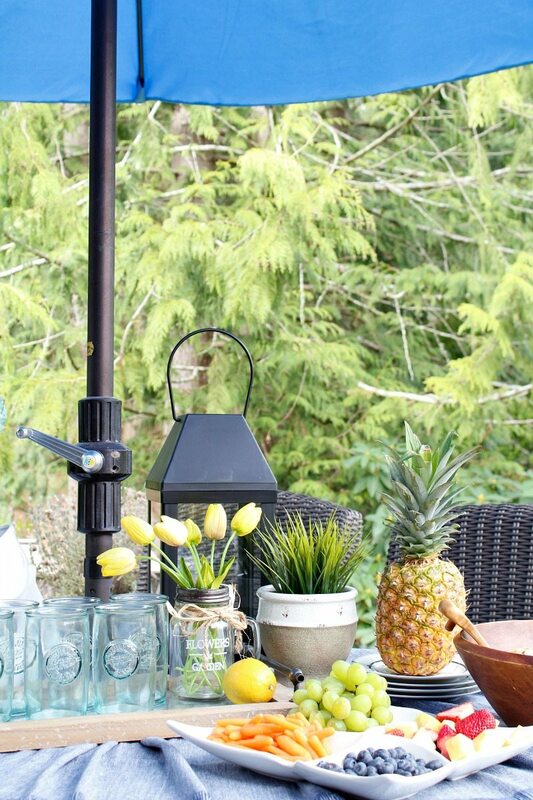 Looking forward to an outdoor dinner party soon. Now to just keep the giant mosquito’s away! 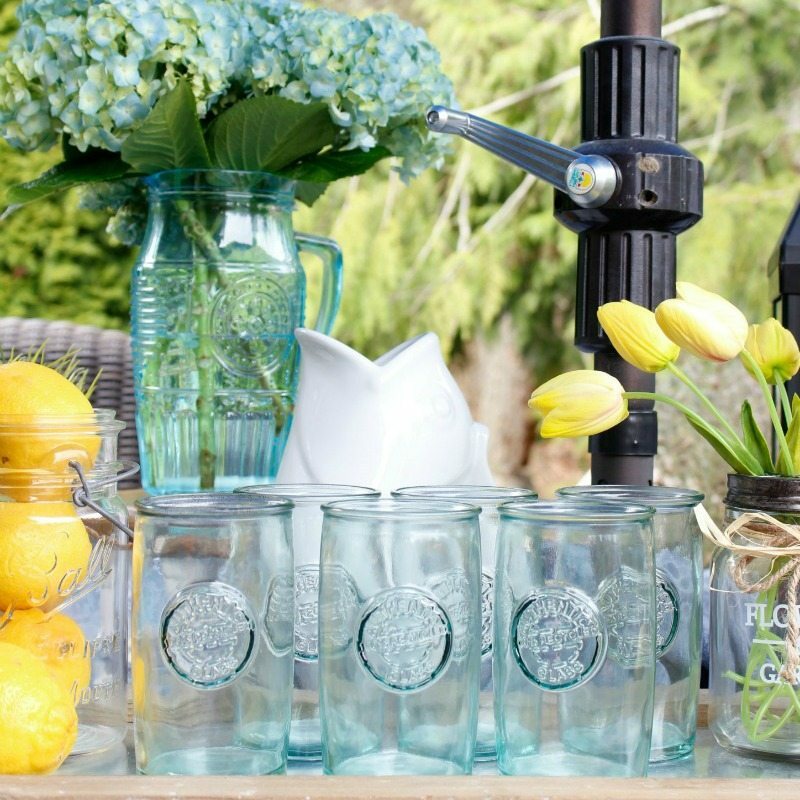 Could you share where the acrylic turquoise drinking glasses are from?